Runs on both Windows and Linux. Deploy the desired components all at once with the general installer, or individually – or deploy as a Virtual Appliance. Handles communication with agents, collecting and storing application data. Can handle tens of thousands of clients while maintaining high-speed operation. 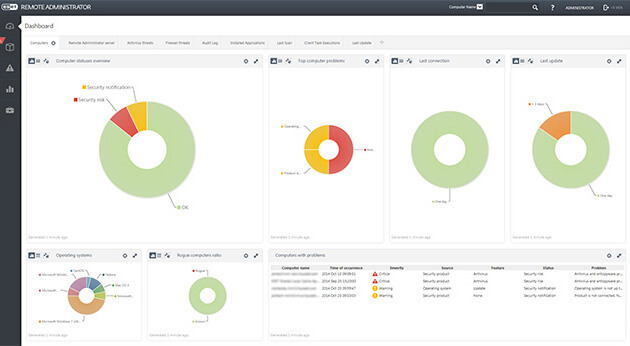 Independent agent runs all tasks, policies and events directly on the endpoint, even without connectivity to Remote Administrator. Developed in consultation with IT professionals, the web-console provides a perfect security overview of the network. Remote locations no longer require a server installation; ESET Remote Administrator Proxy collects and forwards aggregated data to the main server. Working for the admin, ESET Remote Administrator helps to detect all unprotected and unmanaged machines in the network. Handle all licenses via a web browser, transparently from one place, merging, delegating and managing them in real-time. A single instance can serve multiple independent users with specific access and privileges – while the user cannot see the data of other users. Easily try the solution with no need for on-site deployment, with Microsoft Client Access Licenses included. Ensured by Transport Layer Security (TLS) 1.0 standard and self-issued and distributed certificates. Peers are secured by digital signing and encryption. Protect the access to ESET Remote Administrator by 2-factor authentication for up to 10 accounts for free – with self-enrollment directly from the web console. 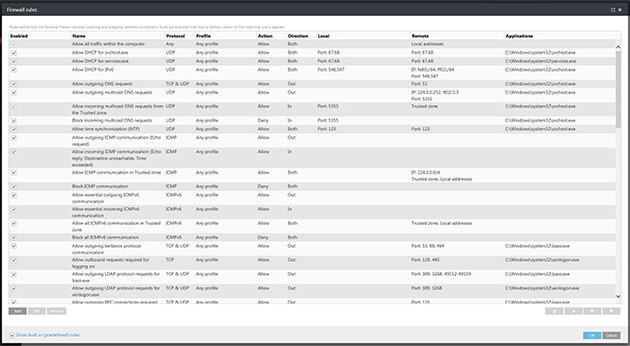 Using the web-console, admins can track-back security incidents and system changes chronologically for each endpoint, based on ESET SysInspector snapshots. Assign clients to static or dynamic groups, setting inclusion criteria for each dynamic group; designated clients are moved automatically. Execute policies right on the agent, applying specific dynamic group policies, even without a connection to the ESET Remote Administrator server. Define if and when a specific task is to be executed. 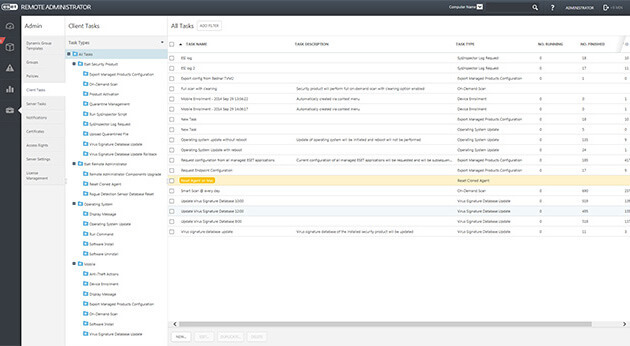 Pair triggers with dynamic groups and tasks executed on a client once it enters the group, and schedule triggers. ESET Remote Administrator collects only data necessary for reports, storing the remaining logs on the client, resulting in better database performance. 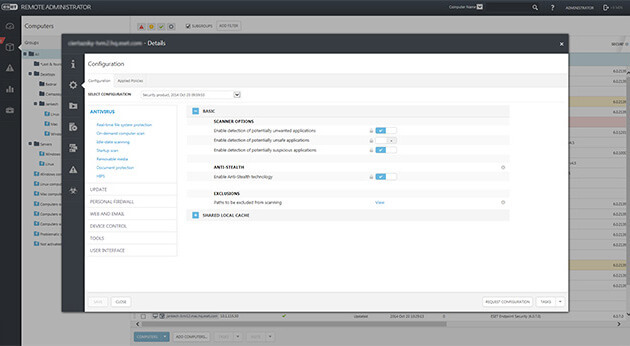 Configure notification options via a wizard-style series of steps. Map templates to the specific dynamic group memberships of clients, or set triggers. All major ESET events are exported in LEEF format, which is natively recognized by IBM QRadar SIEM. Download all ESET Remote Administrator components using a simple wizard for installation on Windows operating systems. Download ESET Remote Administrator Server, Proxy or MDM Connector virtual appliance for deployment in a virtual environment. Download ESET Remote Administrator components individually to meet your network infrastructure needs exactly. Get pre-configured virtual machine running in Microsoft Azure cloud with no need for on-premise installation. ESET is fast, reliable and working very well even on our old machines. Deployment and managing is very easy with the console. 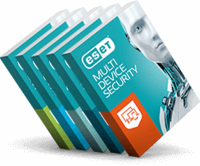 I have to highlight the overall design and functionality of ESET ERA, as well as its accessibility through the web. The environment is very intuitive and easy to use. The big advantage is the ability to create, edit the dashboard in ERA and thus have an overview of what interests me. Also, facilities management and licensing has been 100% revised. The Remote Administrator Console made installing ESET over the network simple. The pre-defined policies enabled the set up to work ‘out of the box’, with only a few tweaks needed to reflect our network infrastructure and specific needs. The main advantage is the ability to manage ESET solution via your browser. The new console is quite intuitive and rather easy to use. Seamless update of previous versions to the latest client software is also an important advantage. Great new Remote Admin console - feels more up to date with current technology trends. Thanks to the central management feature, ESET’s NOD32® system can be administered remotely, so there is no need to travel between our 75 different sites. All-in-one security solutions that protect your workstations, file server, mobile devices and company email. React flexibly as your company grows with a more comprehensive security package for over 25 seats. Please leave us your contact details so we can provide you with a free trial license and deliver a personalized offer tailored to your company's needs. No commitment. 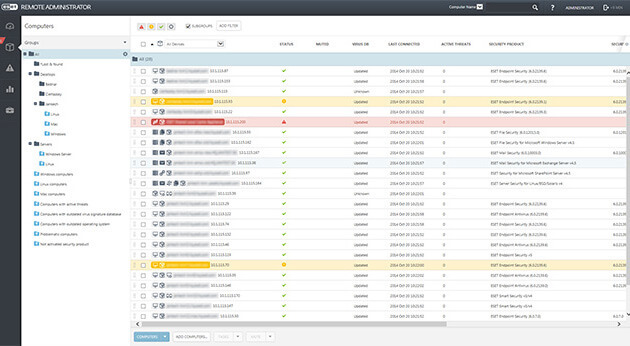 Easily deploy, configure and manage your security software from a single remote console. Mix and match across platforms (Windows, Mac, Linux) and devices (computers, smartphones, tablets and servers). All our solutions are built to have a light footprint and use small updates that won't stress your system.